when I investigated I discovered it was this Blue Jay that was making all the noise. I drove up to Crown Hill Nature Park Sunday and took the big telephoto lens. I may have arrived a little late in the day, Noon, but I spent an hour walking around the lake. It was cool and overcast all day; it didn't reach 60F today. View larger images at PicasaWeb. I went birding in Belmar Park in Lakewood Colorado early Saturday morning. I took the new telephoto lens and spent about an hour circling the park. The telephoto is a little heavy at 4.5 lbs - add the camera and it's 6 lbs! I used auto focus part of the time but found manual focus to work better in some situations. Focusing on a small bird in a tree can be a little tricky; auto focus may be able to focus on the tree but not the bird and birds don't stay in one place for very long. View larger pictures at picasaweb. I joined a group of riders at Charlie's of Denver early Saturday morning for the 6th Annual KSL Benefit Run to benefit the ALT Foundation. There were about 30 motorcycles. I had a great time! I recorded the whole ride on my helmet camera. Below is a synopsis video (9:12) that covers the whole ride. The audio of the first 1:30 is really low (I was too far away) and only in the left channel but audio of the rest of the video is good. Below is a clip (4:13) of the twisty road up Bear Creek Canyon Road. That's Todd in the lead. We have a family of young foxes living outside the apartment building in central Denver. I took this video from the balcony of my apartment Monday evening June 8, 2009. The Suzuki Boulevard has a funky gas gage on it. It's a little hard to tell how much gas you've used and how much is left. The owners manual isn't much help; it tells you that all 5 LED's will be lit when it's full, the left most LED will be lit and the right 4 LED's will be out when there is about 0.9 gallons left, and the left LED will start flashing when there is about 0.4 gallons left. That's not very useful. I did a simple experiment to find out how much fuel each of the 5 LED segments represented. I filled up each time another segment went out then recorded the fuel and mileage. 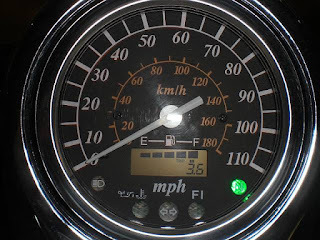 The gas gauge is not liner and should be used in combination with the motorcycles trip odometer. My findings are shown below. Click image for a more readable view. 4.1 US Gallons. 5 LED segments. The gas gauge is not liner; it is a rough guide. Use in combination with the trip odometer. Specifications call for regular unleaded gasoline with a minimum pump octane rating of 87 ( (R+M) / 2 method ). All 5 segments will be lit up while there is more than 3.1 US gallons in the tank. The 5th segment (far right) will go out when the level has dropped to about 3.1 US gallons. The 4th segment (2nd from right) will be lit up while there is more than 1.95 US gallons in the tank. The 4th segment will go out when the level has dropped to about 1.95 US gallons. The 3rd segment (center) will be lit up while there is more than 1.33 US gallons in the tank. The center segment will go out when the level has dropped to about 1.33 US gallons. The 2nd segment (2nd from left) will be lit up while there is more than 0.84 US gallons in the tank. The 2nd segment will go out when the level has dropped to about 0.84 US gallons. The 1st segment (far left) will be lit up while there is more than 0.40 US gallons in the tank. The 1st segment will start flashing on-off when the fuel drops below about 0.40 US gallons. The gas gage is not liner. The gage should only be used as a rough guide and should be used in combination with the motorcycles trip odometer. May 4, 2009: As I left work the 5th segment went out; I was close to a gas station so I pulled in and topped off the tank (the 5th segment came back on as I pulled up to the pump.) It took 1 gallon to top the tank off. The gas gage is not linear. The odometer read 40.1 miles which yields a better mpg than the last 4 tanks and a whole lot better than 29mpg. The last 4 fill-ups have all calculated to be less than 40mpg. May 10, 2009: On the way home from a group ride and picnic the 4th segment went out (2nd from right). I was close to a gas station so I stopped and topped off the tank. It took 2.15 US gallons. Segment 5 (far right) represents about 1 US gallon used and segment 4 (2nd from right) represents about another 1.15 gallons used (total 2.15 gallons used) leaving about 1.95 gallons left in the tank. The odometer read 74.8 miles (34.8 miles/gallon); not quite as good as last time but about 64 of these miles were stop and go city traffic. Still, I think I should be getting better mileage. May 18, 2009: On the way home work the 3rd (center) segment went out. I was close to a gas station so I stopped and topped off. It took 2.77 US gallons. Segment 5 (far right) represents about 1 US gallon used, segment 4 (2nd from right) represents about another 1.15 gallons used, and Segment 3 (center) represents about another 0.62 gallons used (for a total of 2.77 gallons used) leaving about 1.33 gallons left in the tank. The odometer read 82.7 miles (29.8 miles/gallon.) These miles were all stop and go city traffic and also included 4 hours on the ABATE practice range. Never the less I think this is piss poor mileage - time to take it in for a tune up. May 31, 2009: The 4th segment (2nd from left) went out this afternoon. I drove for another 1 1/2 miles before I was could stop and gas up. It took 3.26 US gallons. Segment 5 (far right) represents about 1 US gallon used, segment 4 (2nd from right) represents about another 1.15 gallons used, segment 3 (center) represents about another 0.62 gallons used, and segment 4 (2nd from left) represents another 0.49 gallons used (for a total of 3.26 gallons used) leaving about 0.84 gallons left in the tank. The odometer read 119.4 miles (36.6 miles/gallon.) About 20 of these miles were at highway speeds, about 5 miles were on twisty mountain road, the rest were in stop and go city traffic. While Nick of 5wonderfulthings has started his bicycle trip through England and Scotland, and Jack of 2wheels2alaska is on his 10,000 mile motorcycle trip to Alaska, I prefer the shorter half day rides. I took the motorcycle out for a short easy ride up to Lookout Mountain in the Windy Saddle Open Space Park east of Golden. I stopped at Buffalo Bill's grave and took pictures and shot some video. I took US40 up to Lookout Mountain then rode Lookout Mountain Road back down into Golden. While Lookout Mountain Road is in good repair it is narrow with a lot of very sharp turns and there were 100's of bicyclists on the road. The ride down was challenging but a lot of fun. Looking through the pictures I took, I noticed that I didn't snap a picture of myself or the motorcycle, and it didn't occur to me to put my helmet camera on. Darn! That's what I bought it for! I should make the ride again with the helmet camera. One of the highlights of the morning was seeing the Hang Gliders taking off and soaring high in the sky. I snapped some pictures and posted some video of them. Lookout Mountain Road. That's the road I'm about to ride down on. 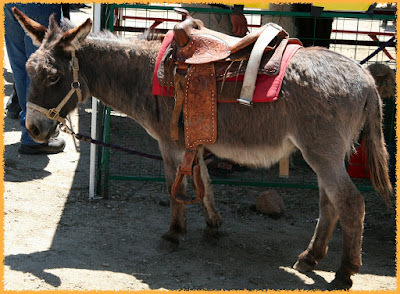 All photos by Clyde Hoadley, Creative Commons, 2009, some rights reserved. Disclaimer: I am not an expert. All I know I learned from Google. The weather has warmed up and the snow has melted off again so I got the motorcycle out and road it to work today. The forecast had called for it to be worm and dry all week but they are now forecasting a cool-down with chance of rain and snow on Thursday. Oh well, it's spring time in the Rockies. I'm not getting the gas mileage that I should be getting. It started out getting 45mpg but it has dropped a little with each fill-up. It's down to 34mpg. 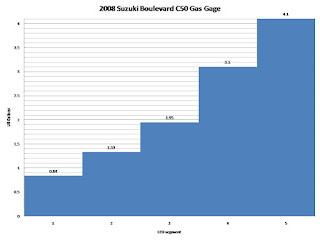 Other C50 Boulevard riders report 45-48mpg city/50-52mpg highway. Something not right. Aside from mechanical problems there are several other factors that can affect gas mileage on a motorcycle. Wind resistance probably has the biggest impact on gas mileage. Anything that sticks out (or up) into the air flowing around the bike as it's moving down the road causes wind resistance. The rider is typically the most prominent wind obstruction on a motorcycle. That's why a lot of motorcycles have a windscreen and fairing. I know this has a major impact at highway speeds but I don't know how much of an impact it has at city speeds. My motorcycle doesn't have a windscreen or fairing. Tire pressure also has an impact on gas mileage. Too low of a tire pressure can can wear out the tread faster and ruin the tire, can make cornering more difficult, and reduce gas mileage. The specifications for my motorcycle calls for 33psi in the front tire and 36psi in the back tire (cold). Some riders will lower the tire pressure down a little for a smother ride. The streets around here tend to have a lot of ridges, ribbons and cracks in them; It's worse at intersections where cars apply their breaks or turn. I had lowered the air pressure in my tires down to 30psi and 35psi hoping it would smooth out the ride a little. I didn't notice any difference so I've pumped them back up. Using the wrong octane of gas can also affect gas mileage. The specifications for my motorcycle calls for 87 octane - I've been using 85 octane. That doesn't seem like it should make too much of a difference until I factor in the fact that from September - February they sell oxygenated gas. Oxygenated gas produces less air pollutants but it also reduces the gas mileage! I need to be buying 87 octane during the summer months and the next higher octane when the gas is oxygenated. I could try a different brand of gas too. Lugging the bike (running at too low an rpm for the gear) also affects gas mileage. My motorcycle doesn't have a tachometer on it so I shift based on what the engine sounds like and how the bike feels to me. This might not be a good gauge for shifting. I tend to shift into 2nd fairly quickly. I also use the friction zone a lot going in/out of the garage and when pulling away from stop lights so the engine might be lugging a little then. The problem is, I don't know what the rpm really is or even what it should be! I miss having a tachometer. I've got the right octane in the gas tank now and have pumped the tires up to the right tire pressure. I think I will get a windscreen. I really don't know if I'm lugging the engine so I won't worry about it.